A relatively young city and never a particularly beautiful one, Berlin is not a conventional sightseeing destination in the same way as, say, Rome or Paris. Few would come here just to look at churches. But this isn't to say that there's nothing to see. Berlin's fascinating history has left scars and reminders all over this huge town, while a new future on the global stage is only just beginning to take shape out of the many construction sites that currently dominate the centre - and have become a tourist attraction in them. Most of the stuff that could properly be described as omissible - either because you really ought to see it or simply because you couldn't avoid it if you tried - is in and around the Mitte district. 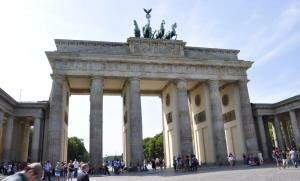 Such historical sights include the Brandenburg Gate, the grand structures of Unter den Linden, Alexanderplatz and the remnants of the old Jewish Quarter. But this is only a small segment of this enormous, sprawling city - carved up by rivers and canals, punctuated by pockets of green and fringed with lakes and forest. During its rapid growth in the latter part of the nineteenth century, it gobbled up a number of small communities and then, in the mid-twentieth century, became two cities with a wall between them. Today the Wall is down and the small towns exist only as names on the map, but there are still big differences between one part of town and another. From beginnings as a small-fortified enclave on an island in the Spree (now the Museuminsel), Berlin soon expanded into what is now the borough of Mitte. For many years, that's pretty much how it stayed: the court preferred the pleasures of Potsdam or Königsberg and Berlin remained little to a trading town. But towards the end of the seventeenth century, Kaiser Friedrich Wilhelm took a town that had been devastated by war and disease and started shaping it into a modern metropolis - establishing a harbour, building Schloß Charlottenburg, and encouraging immigration, particularly of Jews and Huguenots. Within a century, Berlin had been transformed into one of Europe's great cities: a military, commercial and cultural centre. The enormous boom that started in 1871, when Berlin was named the capital of the newly unified German Reich, dwarfed this expansion. By the 1920s Berlin had become a world city, ranked with New York, London and its perennial rival, Paris. Greater Berlin was officially divided into 20 Bezirken, or boroughs. Today there are 23, the extra ones having been added to East Berlin after 1949. Hitler hated Berlin (and, it must be added, Berlin largely returned the compliment) and directed Albert Speer to turn it into something more to his liking - the megalopolis of Germania, capital of the Thousand-Year Reich. World War II slowed down his plans, and only a few buildings (such as Tempelhof airport or the Olympiastadion) and some grandiose street plans (the East-West Axis including the grand Großer Stern roundabout at the Siegessäule in the Tiergarten) were completed. The Allies then bombed the city into submission, leaving a good half of it completely uninhabitable. Massive rebuilding was necessary on both sides of the Cold War divide. As an island now stranded in the middle of East Germany, West Berlin had to come up with novel solutions, since there was nowhere for it to expand. This explains the number of modern Dachbau, or rooftop, extensions of old buildings. East Berlin was under heavy pressure to serve as a showcase for the glories of communism, so what little money there was mostly went into architectural showpieces that were both cheap and overblown (such as Alexanderplatz). The rest either remained soot-encrusted and bullet-pocked, or else was flattened and flat-blocked. At Potsdamer Platz, the once and future centre of town, you'll find scores of tower cranes rising from the building project intended to make this the city's new commercial centre. Since this once-bustling intersection was bombed flat and then wound up just on the east side of the Wall, it was a literal no-man's land for many years, and today's construction will transform it once again into an area of corporate skyscrapers and seats of power. At the time of going to press, the Debis building had already risen from the dust and the Sony building was beginning to take shape. To the north, the Reichstag is acquiring its new Sir Norman Foster dome and beyond that construction proceeds on the Spreebogen government quarter and Lehrter Stadtbahnhof, intended to be the city's new main train station. Originally a hunting-preserve for the local princes, the park for which this borough is named is surely one of the nicest in Europe. It was opened to the public when the Brandenburg Gate was dedicated, and they're still coming: on a sunny day in summertime it hosts thousands of nature-lovers, joggers, kids, football players and Turkish barbecues. It's so lovely there you may be tempted to pitch a tent, but don't: it's illegal. On the park's outskirts, there are lots of hints of the past: a stretch of Tiergartenstraße contains the mostly still-shuttered remains of the pre-war Embassy Row. Just beyond is the Kulturforum, where one can find the Neue Nationalgalerie, the Staatsbibliothek, and the Philharmonie, home to the world-renowned Berlin Philharmonic Orchestra and famous for offering near-perfect acoustics and vision from all of its 2,200 seats. The Musikinstrumenten Museum is tucked away in a corner of the Philharmonie complex. Also in this area is the Bauhaus Archiv, documenting the famous design school, which moved to Berlin from Weimar after that city elected a Nazi city council. The Haus der Kulturen der Welt (formerly the Kongreßhalle), is an impressive bit of modern architecture whose reflecting pool contains a Henry Moore sculpture. The Haus was designed by Hugh Stubbins, its nearby carillon by Bangert Jansen Scholz Schultes. A gift from the Americans known to the locals as the 'pregnant oyster', it collapsed shortly after being opened - an event that provided the name for one of Berlin's best-known bands, Einstürzende Neubauten. Today, it houses superb exhibits of world culture and hosts musical ensembles and cinema screenings from far-off lands. Alongside the building runs In den Zelten, a street with a history as long as it is short, having been a campground for Huguenot refugees, the site of Berlin's first coffee-house, and for a short time in the 1930s, Dr Magnus Hirschfeld's groundbreaking Institute for Sexual Research. Schloß Bellevue, a minor palace from 1705 and once a guest house for the Third Reich, just off the Großer Stern, now houses the German President when he's in town: a flag flying from its roof is the signal he's in. When he is, there are a few more soldiers in the nearby Englischer Garten than make for a comfortable stroll. Like its more famous cousin in Munich, this garden came about because King Ludwig I of Bavaria decided that the reason why there weren't constant revolutions in England was because of the plentiful, green open spaces in the cities. The idea caught on, and these gardens became such an integral part of German life that Lenin once commented that revolution in Germany was impossible because it would require people to step on the grass. Just beyond the Schloß at the Großer Stern, there is a monumental statue of Bismarck set back from the road, flanked by statues of Prussian generals Moltke and Roon, reminders of the past which, judging from the constantly reappearing graffiti, seem to have a few people worried. Behind Schloß Bellevue, bounded by Bachstraße, Altonaerstraße, and the Tiergarten, is the Hansaviertel, a post-war housing project whose buildings were designed by a who's who of architects in a competition. Although perhaps of most interest to specialists, it still manages to draw busloads of architecture students from all around the world, who see something other than a group of fairly sterile, modern buildings.